The benefits of karate for people of all ages are well documented. Beyond just good fitness it gives you valuable self-defence skills, challenges the mind and gives a great sense of life balance. For teenagers that life balance and ability to understand your place in the world and have the confidence to stand up for yourself and shape your own destiny is crucial. To achieve this, teenagers need to learn respect for those around them, confidence and especially self-control. Karate provides a total body workout that not only trains your body but your mind as well. It provides a great form of physical fitness and stress release. Add to this and the discipline developed from karate means you can stick with a lifelong fitness regime. I am not talking about standing on a pole which is physical balance but more so about Life Balance. Karate promotes two kinds of balance – physical balance and life balance. Physical Balance is easily achieved through repetition and training. Life Balance, however, is a bit more difficult to attain in today’s world. As teenagers grow they need to understand the balancing act that is life. They need to find the happy medium: what we eat, how much time we spend working versus relaxing, spending time alone or with a group, etc. These lessons enable teenagers to find their own personal sense of balance in their lives. Karate is again a great teacher of this. Being able to control one’s own emotions is something that most teenagers struggle with. A key philosophy in Karate is if you can learn to control your body then you can learn to control your mind and emotions in the same way. this self-control if developed as a teenager will carry through into their adult life. 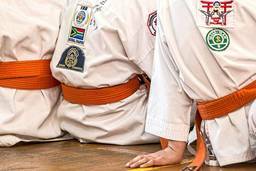 Regardless of size or gender everyone is treated the same in a karate class. This means that different people will struggle and overcome different obstacles but all will learn skills and achieve goals together gaining confidence in themselves but also from those around them. These accomplishments build belief in themselves and confidence that they can achieve anything they set their mind to. Valuable lessons for life. This is not just for those around you but for yourself. Respect is a core value for martial arts. Learning to have respect for things, can help develop control and balance as well. For teenagers, learning respect will help in all aspects of their lives, be it school, friends, or a new job. It helps people of all ages to establish a sense of dignity and well being. There are many many more benefits to joining a karate class and discovering martial arts for teenagers. Karate can provide fundamental skills that can improve all aspects of life all while being fun and rewarding. For more information about karate for teenagers, please contact the expert contributor.